Can We Read Revelation Literally? Because of its unusual character, Revelation has been approached from a number of interpretive principles, some of which raise serious questions concerning its value as divine authoritative revelation. All of the methods used by evangelicals today have a high view of scripture. Most commentaries use the grammatical-historical method of biblical interpretation and each claims to be developing a theology of Revelation which is applicable to the first century audience, the present modern audience, and every reader of Revelation in church history. But everyone who seriously tries to read the book of Revelation struggle with the question of how interpret the apocalyptic symbols of the book. Let me offer a somewhat embarrassing example of literal interpretation gone wild. 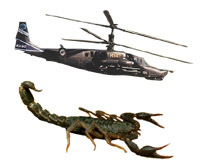 Hal Lindsey’s now famous identification of the scorpion / locust from the Abyss as helicopters with tail-gunners. Lindsey is an example of an allegorical approach to the text rather than a literal approach since his goal is to “read into” the text modern warfare. This is ironic since Lindsey came from a Dispensational tradition which valued literal interpretation, especially when reading Old Testament prophetic texts. This point is made more generally by Malina and Pilch, who comment that all popular modern approaches to the book of Revelation are in some way allegorical – it is hard to disagree with them on this point! (Social-Science Commentary on the Book of Revelation [Minneapolis: Fortress, 2000], 215). To interpret a scorpion as a helicopter is no less allegorical than a 16th century commentary identifying the scorpions the rise of Islam. When we read Revelation, we need to employ the “hermeneutics of humility” (Osborne, Revelation, 16). We must approach the book as best we can, employing all the proper tools and methodologies, but ultimately there will be elements of the book we cannot understand because of our distance from the first century. So is it impossible to read Revelation “literally”? I think that it is not only possible, but required if we are to make sense of the book. The real problem is properly defining what “literal interpretation” means. Literal interpretation does not mean that we take the words as the read on the page, but rather we recognize when the author intentionally used metaphors or other figures of speech and attempt to read those metaphors as he originally intended them. Returning to my helicopter illustration, I would say that there is no way that John intended us to hear the metaphor of a locust rising from the Abyss and understand a modern military machine. He intended something – our job as readers is to figure out what that original intention was. How would this understanding of literal interpretation help us to read Revelation? I feel that the idea of taking scripture literally is key to what we as Christians are called to do from the Bible. John wrote Revelation from his own personal perspective. I think that when reading Revelation we are called to look at it literally, but in a literal sense, John had an heavenly experience. As a human, there may be things of heaven that the human brain couldn’t understand. John very well might have been using metaphors to what he saw by comparing them to the closest thing that he knew that he could describe with detail from our world. This is the way that I personally take what is said in Revelation, as John describing best what he saw with what he knew. I agree. There no doubt will be some confusion in that respect since we did not witness the revelation ourselves. Nonetheless, scripture is given to us so that we can understand. Rather, the scripture that we received, is meant to be understood. If John was incapable of understanding what he was seeing, then why have him see it, let alone record it as scripture. There is a reason we have Revelation and there is certainly understanding that can be gained from it. I read the book of Revelation literally with the understanding that it is prophesy which has been made known by the prophets since the world began. (Luke 1:70; Acts 3:21). If we are to understand, this truth has to be separated from the truth that Paul the apostle of the gentiles preached. This truth was hid in God since the world began until it was made known through the apostle Paul. (Romans 16:25-26; Ephesians 3:4-5,3:9). The key to this understanding is 2 Timothy 2:15, separating what was known from what was not made known. God has a heavenly program as well as an earthly program and the book of Revelation is the culmination of God’s earthly program. I have mixed opinions on reading Revelation literally. On one hand there are segments of revelation that seem to be meant to be interpreted literally while there are other sections that seem to need to be interpreted allegorically. In general I try to understand Revelation based on what the original audience of revelations would have interpreted the book. I try to use common sense in distinguishing what could be allegorical and what should be interpreted literally. It is very difficult to do, especially with all of the different theories that are spouted as the correct interpretation. I think if I had an understanding of how literal interpretation differentiated between that which was meant to be interpreted literally and that which is allegorical it would help my understanding of how to read Revelation. There are some literary works that are meant to be very allegorical, “Song of Solomon” comes to mind, while there are other works that are meant to be very literal, the book of “1 Kings” as an example. So I think that would be the most help for me in figuring out if how to read Revelations. I did just mention this in another post. John would have only a limited knowledge when writing. There is a good chance that John didn’t know about helicopters and would have described them as scorpions. However, I think that in times like that he would have known what a scorpion was and would have described them differently. I think we should definitely read it as it written, but i also think that John would have only had limited knowledge of future items. The book of Revelation is without a doubt a difficult book to work through. That’s one of the reasons that when a congregation is asked what they would like the pastor to teach on, Revelation is always on the list. We don’t quite know what to make of it. There are obvious metaphors, Such as John seeing the “Lamb of God” in Revelation 5:6. I don’t believe he saw an actual slaughtered lamb, but instead saw Jesus, who took the place of the sacrificial lamb of tradition, hence the metaphor. I also really like what Brandyn Miller posted about having limited knowledge about future items and power. Seeing planes and rockets from a 1st Century mindset would be disorienting. However, regardless of how literal you take the writings in Revelation, I think we must take it as fact. Remembering that while we are able to interpret some of Revelation as allegorical or metaphorical, it can be a slippery slope to misinterpretation. I am a big advocate for the historical-grammatical way of looking at things. What I think is important to remember is that it is not enough just to do first century studies on the imagery in Revelation but to also do some Jewish study into the imagery in the Bible. John was a Jew who thought like a Jew and wrote like a Jew from a Jewish, albeit Hellenistic, background. But I think that his imagery is steeped in the Old Testament traditions of prophets like Daniel and Ezekiel. To forget to study the the tradition from which provides the background upon which John paints his imagery is a huge mistake. I think, as I said in the other post, that we should approach the text with a literal mindset where it is clearly literal, and where it is not, to use the methods appropriate to the grammatical tools being used by the writer. Interpreting the Bible can definitely tricky at times. Where at some points, the Bible is intended to be overwhelmingly literal there are other points where it can be less obviously metaphorical. So as readers of a book that was written a couple thousands of years ago, how can we appropriately decide what is and isn’t supposed to be taken from a literal standpoint? I believe this all comes down to necessary discretion as the reader. In the case of John writing about the end times, I do believe that a lot of the material is metaphorical. John is simply truing to describe these things in a way that we can fully understand. They represent on certain levels the consequences and events that are to come. I have heard so much about Revelation and have been confused by it myself so many times. I think you are right to say we need to apply the “hermeneutics of humility” to this study. Humility to admit that we don’t actually have all the answers and study time in the library won’t bring us any closer to understanding these weird words than 2000 years of Christianity has brought anyone else. To me, this is a time to show a child-like faith. Not to say that we just dismiss what is being said, but that we do our best to understand everything written (from people we trust or books we trust) but if there is a point where nobody actually knows what it all means, we just need to admit it and move on. Our faith in Jesus that simply doesn’t require every question to be answered so we understand it should step to the front in our study of Revelation. This would also mean, perhaps that John expected futuristic people to understand his text at all: In particular this would be true if the targeted text were for people of 70 AD only, i.e., Hal Lindsey has had it wrong more than once and his dates too. Yet the Left Behind movies generate a lot of interest and tons of money as well. And if you really believed we were in the End Times would one charge money for a movie? Hardly, if the person had a pure heart. It makes me suspect of the motives. Can anyone see Jesus giving His predictions based on money: Absolutely NOT. Good points all. I think we can all agree a “Hal Lindsey model” is not ever going to be the right way to read revelation. Popular apocalyptic literature (dystopian movies, books, etc.) are always popular whether they have a religious motivation or not. But you are right, Jesus would not have generated income as an apocalyptic prophet, nor would he make lurid predictions to generate a following, etc. Hey! I just wanted to let you know that I nominated you for the Versatile Blogger Award! I really think your blog is great! History is the only way to reliably interpret the Apocalypse. I generally take numbers and colors literally. A thousand years is a thousand and red, black, and white are red, black and white but the horse might be a sea where the threat originates. I also think 666 is a year, a mark, a beginning of a threat and it must be calculated. The idea of having humility when reading books like Daniel and Revelation is important. We are not going to understand everything, and that is okay. The language used is not always easy to understand. It is also easy to misinterpret what the original author was trying to say and that can be dangerous. The authors use poetic language like figurative and emotive language to get the reader or audience to understand what they are talking about. It is then for the reader to decide how to interpret it. The book, “Plowshares and Pruning Hooks, by D. Brent Sandy does a great job of teaching the reader how to better interpret this message. He talks about different figures of speech, reading the context of the time, relating the events of the past to the present, and of course metaphors. To take these books literally, as taking the words as read on the page, would not be a good option. Rather, we need to understand the different language being used and its context. The Hebrew gives both literal and “figuratively” translations. For example: Deu 32:31 For their rock is not as our Rock, even our enemies themselves being judges. I taught seven preteens, a few Words, that are Bible Symbols: water =Rev 17:15 And he saith unto me, The waters which thou sawest, where the whore sitteth, are peoples, and multitudes, and nations, and tongues. I asked them to draw a picture of a sea of humanity….they all drew tall buildings then I asked them cast “something like a great mountain burning with fire” into the Sea of Humanity…. There MORE BIBLE SYMBOLS…when you consider Lucifer confused a third part of the angels to be disloyal to Gods Government….Rev_12:4 And his tail drew the third part of the stars of heaven, and did cast them to the earth: and the dragon stood before the woman which was ready to be delivered, for to devour her child as soon as it was born. “The FEAR OF THE LORD IS THE BEGINNING OF WISDOM” Psa 111:10 The fear of the LORD is the beginning of wisdom: a good understanding have all they that do his commandments: his praise endureth for ever. Can you image my father returning from World War II, as non combatant, a friend of Desmond Doss, the hero of Hacksaw Ridge. . .teaching us to FEAR THE LORD….rather than man, nature or the devil? BIBLE WORDS…..embedded in GOD COMING TO DESTROY….THE DESTROYER…the angel, the robot HE CREATED…that is trying to undermine the GOVERNMENT OF GOD…..has a name as THE DESTROYER…. I would rather plant my feet on the SOLID ROCK…JESUS CHRIST…and KNOW HE KNEW…before the world began…that SATAN would be defeated! Because we see his heart is like a stone, hardened. I search my heart daily because I want no part in breaking the heart of my Saviour! tu for allowing me freedom of speech.. It is a very dispensational feature to read the scriptures literally. It keeps a person from coming up with spiritualized conclusions that were definitely not the original intentions of a certain passage. Reading Revelation literally, however, would help the reader understand the different creative forms of word play. It is just like English in that aspect. There is no way we would read a Facebook conversation now days and take it at face value. How many people have actually ROFLed in their life? Understanding context and word usage will allow a reader to understand that the Dragon and the Great Whore are indeed metaphors or allegories. One has to be very careful in interpreting Revelation because it can be so easy to tag Oprah as the Anti-Christ (maybe she is) or use numerology skills to determine when the Rapture is going to happen. Revelation is going to play out whether or not we understand it. So in my opinion, we should stop worrying about what images mean because like the article says, we will at least be somewhat wrong. Just keep trusting Christ and all things will be fine.